The new slate has an aluminum body, a dual-core processor and quad-core GPU, Android 4.1 with a rich collection of preloaded apps and a good price. Ematic introduces a new tablet for budget conscious buyers and it even succeeds in adding a few premium touches to it, for example a sleek, aluminum body. "The epitome of portability and productivity, the EGP008 is an essential device for those looking to enhance their professional mobile lives." and allows its users to easily access an impressive amount of digital content via Google Play. The EGP008 comes with a rich collection of preinstalled software that includes Kingsoft Office, Evernote, Google Chrome, Pogoplug and many others. 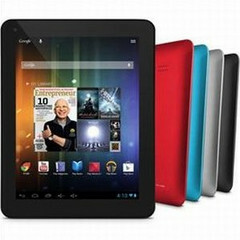 The tablet can be purchased at www.walmart.com for $129.99.